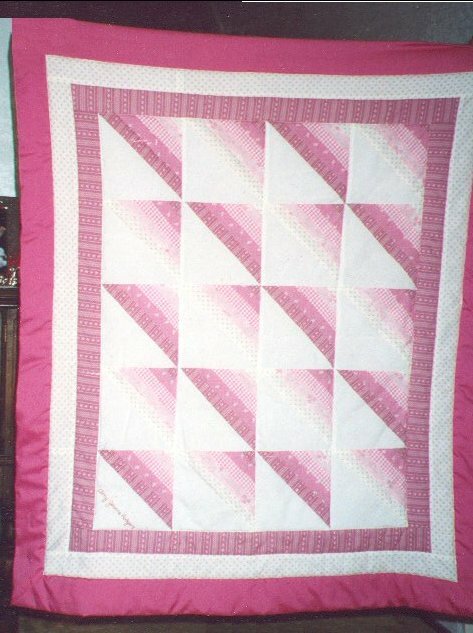 When my brother-in-law and sister-in-law, Paul and Donna, had their daughter, Amy, I was once again in the baby quilt mode. :-) Another pink quilt and another easy pattern made for a quick quilt. This pattern is Sunshine and Shadows, alternatively known as Roman Stripes. It looks complicated, could be complicated depending on how you construct it and looks really nice. Being an easy sort of gal, I discovered a fast method of making all those half-square triangles without having to mess with sewing triangles together .. Eleanor Burns (of Quilt in a Day fame) does a marvelous job of describing this technique of a quick quilt tube method. This time, I hand-embroidered the baby's name in the solid fabric part of one of the blocks.